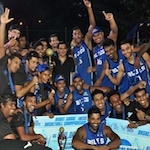 The visiting cagers from India cruised into the final of their FIBA Middle Asia Zone Basketball qualifying championship 2007 when they outplayed hosts Sri Lanka by a mammoth margin of 117 to 66 points yesterday evening at Sugathadasa Indoor Stadium courts, Colombo. The Lankans after a promising start sailed to live up to expectations and were completely beaten by a superior outfit. The Indians took a commanding 52 to 28 points lead at half time and set a pace for an impressive victory. Before the half time the scores stood at 23 to 10 points in favour of Indians at one time. However, the visitors dominated the play with their superior height and brilliant shooting. Sri Lanka missed lot of scoring opportunities through their faulty shooting which opened the way for opponents to grab the ball and to collect more points. However, lankans were trailing by a huge margin and they could not get closer to their opponents at any stage. Indians came up with a fine performance in the latter part of the game scoring more three pointers. Shiv Kumar (187-F/G-85) with a massive 23 points was the top scorer for the winners while Lokesh Yadav (16), Riyaz Uddin (186-G-81) (17) and Jayachandra Shenoy Subash were the other chief scorers for visitors. The Indian team was led by Muraleekrishna Ravindran and the other members of the team were Sambhaji Kadam (176-G-80), Dulip Kumar, Rajana Sanjay Raj (204-C-84), Anoop Mukkanniyil (192-F-86), Roshan Padavettiyil, Ravikumar Krishnasamy and Jayaram Jat. Prageeth Pushpakumara (19), Randima Sooriyarachchi (10) and Shanaka Perera (9) were the main scorers for Lankans. Jagath Kulatunga captained the side and the others were Harshadeva Yasaratne, Virantha Bastian, Chamath Danawansa, Gamunu Sandaruwan, Roshel Mendis, Anushka Nilakshan, Asanka Suwaris and Vajira Kumarasinghe. On Tuesday the Kazakhstan overcame India by 88 to 40 points to secure their place in the final after leading 45 to 23 points at half time. Yevstigneyev Mikhail (17) and Ponomarev Anton (15) top scored for winners while Jayachandra Subash (12) and Riyaz Uddin (9) were the main scorers for losers. Kazakhstan and India will qualify to take part in the FIBA Asia championships which will be staged in Japan.